Is there a better alternative to Desktop Photoframe? Is Desktop Photoframe really the best app in Desktop category? Will Desktop Photoframe work good on macOS 10.13.4? Desktop Photoframe…With computers serving as the repository for our digital lives, it's a shame that most of the time our photos remain hidden away out of sight. 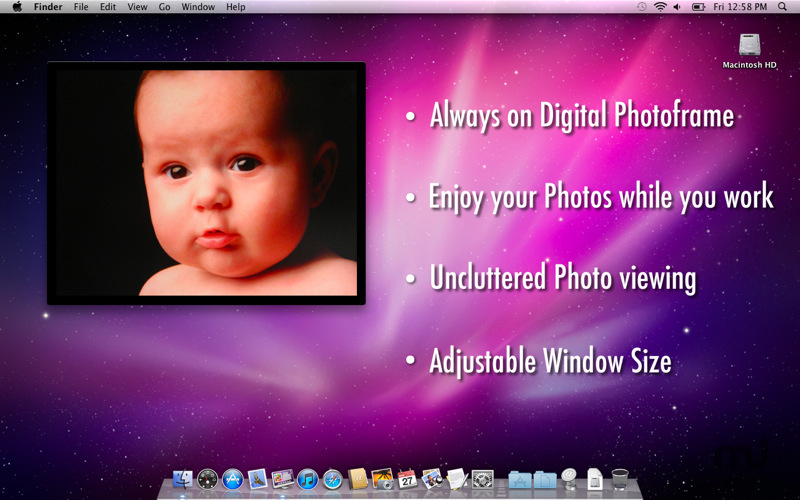 Desktop Photoframe solves this problem by presenting your photos in a resizable digital frame that can be placed anywhere on your Mac's desktop, for an uninterrupted view or continuous slideshow of your entire photo library. Desktop Photoframe needs a rating. Be the first to rate this app and get the discussion started! Simply point Desktop Photoframe at your picture library, choose from a range of border types, and enjoy a never ending presentation of your family photos, holiday snaps, pictures of the kids, images from the web, or photos of your significant other. Desktop Photoframe can sit on the desktop or float above all other windows, so that even when you are busy working, you are never more than a glance away from reliving the most memorable and priceless moments of your life.